Lakeman, R. (2001, 21-22nd November). 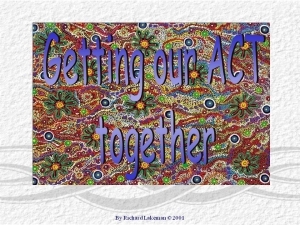 Getting our ACT together (Invited workshop presenter). Paper presented at 'Does Community Care Work?' An International Mental Health Conference, Wanganui Convention Centre, NZ. Assertive Community Treatment (ACT) refers to a loosely related set of principles and practices focused on improving the lot of those identified as 'heavy service users', or those people who have historically been difficult to engage in treatment. A burgeoning body of research testifies to the effectiveness of ACT and a bewildering number of acronyms such as PACT, MIT, MCT, TCL and MST have been coined to describe services more or less faithful to ACT principles. This paper describes the key principles of ACT, research on outcomes and ACT programmes, presents a sketch of the Mobile Intensive Treatment Team in Townsville and critiques ACT from an ethical perspective. It proposes that ACT ought to commence from a philosophy of community mental health firmly grounded in respect for people, and ought to be the primary business of community mental health services. A common idiomatic phrase in mental health care is 'well known' client, patient, or service user. This phrase is often followed by “to mental health services” or some such, suggesting that a “service” can really know anything. Notwithstanding mental health services, especially public ones are a repository for a lot of information, such as facts about people, their service use, diagnosis, notes and assessments of various kinds; this conglomeration of information is not knowing, any more than a library may be “knowing”. Knowing is a distinctly human activity. This paper will argue that this phrase is arrogant, a signifier of ignorance and ought to be relegated to history or back room banter with phrases like “frequent flyer”, “bed seeker” and other derogatory and objectifying language. Lakeman, R. (2017). Mandated locked wards and mental health nursing. 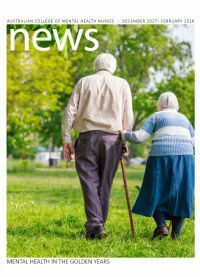 ACMHN News, Summer 2017, 18-19. The prevailing naive bio-pharmaco-centric approach to human distress has not been found to be helpful to most and often serves to obscure alternative ways of viewing and addressing problems. The issue of potential conflict of interest and its risk to professional integrity in journal article publication has been strongly debated in medical circles. Most medical journals adhere to international requirements for disclosure of potential conflict of interest. 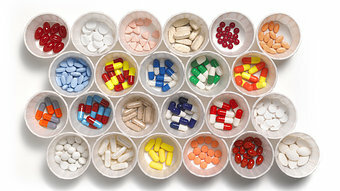 The debate on this issue in nursing, and specifically mental health nursing, has been neither prolific nor strong, despite nursing's potential to influence particular viewpoints about treatment and indeed to prescribe particular treatments; and nursing being a target for pharmaceutical industry marketing. The purpose of this paper is to raise debate about potential conflict of interest in journal article publication and to make recommendations for the management of such potential for this journal. Examination of the names used to signify a nurse who specializes in working with people with mental health problems indicates the absence of a shared nomenclature and the frequent conflation of the terms 'psychiatric' and 'mental health’. Informed by the work of Derrida (1978) and Saussure (1916–1983), the authors encourage the deconstruction of and problematization of these terms, and this shows that what nurses who work with people with so-called mental illness are called has depended on where they have worked, the vagaries of passing fashion, and public policy. Further, there are irreconcilable philosophical, theoretical, and clinical positions that prevent nurses from practicing simultaneously as 'psychiatric’ and 'mental health’ nurses. Related service user literature indicates that it is disingenuous to camouflage 'psychiatric’ services as 'mental health’ services, and as signifiers, signified, and signs, psychiatric and mental health nursing are sustained by political agendas, which do not necessarily prioritize the needs of the person with the illness. Clearly demarked and less disingenuous signs for both mental health and psychiatric care would not only be a more honest approach, but would also be in keeping with the service user literature that highlights the expectation that there are two signs (and thus two services): psychiatric and mental health services. Lakeman, R., McAndrew, S., MacGabhann, L., & Warne, T. (2013). ‘That was helpful … no one has talked to me about that before’: Research participation as a therapeutic activity. International Journal of Mental Health Nursing, 22(1), 76-84. There is considerable interest in the various ethical problems associated with undertaking health and social science research. Participants in such research are often considered vulnerable because of their health status, social position or dependence on others for health and welfare services. Researchers and ethics committees pay scrupulous attention to the identification and amelioration of risks to participants. Rarely are the benefits to participants of engaging in research highlighted or drawn to the attention of potential participants. Such potential benefits need to be considered by researchers and reviewers when considering the balance of benefits and harms associated with research projects. This paper particularly considers the psychotherapeutic benefits of participation in research. Lakeman, R., & Matthews, A. (2010). The views and experiences of members of new communities in Ireland: perspectives on mental health and well-being. Translocations: Migration and Social Change, 6(1), http://www.translocations.ie/volume_6_issue_1/index.shtml. Ireland has a long history of outward migration but in recent years Ireland has become a destination of choice for migrants from the rest of the world. This has posed a challenge to Irish institutions and Irish society. This paper reports on the findings from a community development project undertaken in partnership between Cairde (a non government resource and advocacy organisation for ethnic minority groups) and Dublin City University. Members of new community groups in Dublin who were affiliated with Cairde took part in focus groups exploring their perceptions regarding mental health, mental ill-health and their experiences of mental health care provision. Participants focused more on their everyday experiences affecting their health and well-being rather than presenting their difficulties from within an illness paradigm. Whilst most participants had experience of accessing health services they had little contact with specialist mental health services. So while the study was designed to focus on conceptions of mental health/ill-health and services, the findings highlight structural inequalities that some migrants face in relation to legal status, accessing educational, occupational opportunities, and social service eligibility; all aspects of their everyday lives that cause them distress and fear. Lakeman, R. (2010). Mental health nursing is not for sale: rethinking nursing's relationship with the pharmaceutical industry. Journal of Psychiatric and Mental Health Nursing, 17(2), 172-177. The relationship between nursing and the pharmaceutical industry is conflicted. The pharmaceutical industry holds commercial interests which are incompatible with the interests of nursing and service users. Nursing and nurses are courted by the industry, most obviously to influence prescribing practices but also to promote a world view that psychiatric drugs are essential, and to sanitise the image of the industry (which has recently been rocked by fresh accusations of unethical practice). Nursing's image, the public trust it enjoys and ultimately good relationships with service users stand to be tarnished unless nursing rethinks its relationship with the industry. Nursing ought to reposition (or restore its position) next to service users rather than next to the pharmaceutical industry. This paper was peer reviewed and originally accepted for publication in Mental Health Practice. It was even advertised for publication. However, it was withdrawn by a new editor. A satisfactory explanation was not provided and despite a request for the grounds for this editorial decision to be shared with readership this was not provided either. Lakeman, R. (2000). Negotiating the ethical minefield of psychiatric nursing practice. 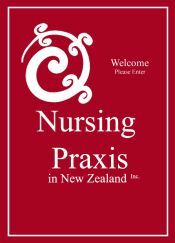 Nursing Praxis in New Zealand, 16(3), 38-48. Psychiatric nursing practice can be likened to an ethical minefield. Nurses are often in the middle of the minefield and are pushed and pulled by forces, which are sometimes beyond their control. This paper signposts some of the more problematic areas of practice so that nurses may be equipped with at least a broad over-view of the ethical terrain. Lakeman, R. (1998). Removing the toll bridge to compulsory treatment. Kai Tiaki: Nursing New Zealand, 4(8), 17-19. Lakeman, R. (1996). The ethics of bathing. Kai Tiaki: Nursing New Zealand, 2(2), 13-15. This paper discusses the ethics of bathing someone against their expressed will. Hurley, J., Lakeman, R., & Angking, D.R. 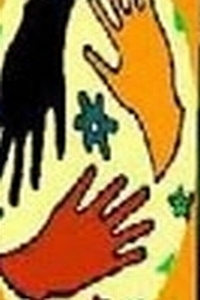 (2012, 3-6 October) 'Cut from a different cloth: mental health nurse identity under the MHNiP in Headspace', Paper presented to Australian College of Mental Health Nursing 38th International Conference: The fabric of life, Darwin, NT. This paper presents findings from an ethics approved phenomenological study exploring mental health nursing roles and capabilities under the Mental Health Nurse Incentive Program (MHNIP) in two regional centres. Findings will be used to generate critical discussion on profes- sional identity factors such as clinical autonomy, nursing capabilities and effective interventions for young people. Happell, Palmer, and Tennent (2010) identify that the MHNIP offers a greater range of service provi- sion than has been previously available. 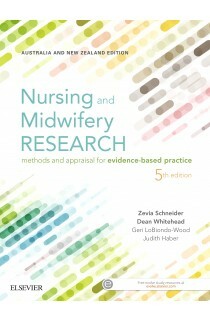 Indications are that nurses working within the MHNIP are in fact offering a range of interventions beyond what was initially envisioned through providing effective talk based interventions, rather than restricting their practice to more his- torical roles of risk assessment, mental state examination and generic support. 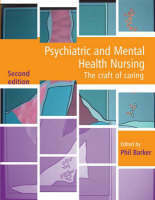 Mental health nurses offer unique contributions to the delivery of talk based interventions (Hurley, 2009). Despite this, perceptions of some referrers toward mental health nurse capability and the funding rules under the MHNIP may be seen as barriers to nurses undertaking such formal talk based therapy roles. Findings show that organisations such as Headspace offer pathways to address these barriers and to entrench talk based therapy roles into wider understandings of mental health nurse identity, to the benefit of service users. Rogers, C., Davidson, B., Lakeman, R., & The Online-Supervision.net Research Group. (2003, 16-17 May). Internet Communication and Research in Computer Mediated Clinical Supervision - a Methodology Paper presented at the BACP's 9th Annual Research conference: 'Research and Diversity' Holiday Inn, Leicester. Introduction This research project examines communication processes between clinical supervisors and supervisees who engage in an online supervisory relationship via the Internet. An international team of nine researchers, comprising professionals and academics from a wide range of disciplines, collaborated in developing a long term research study to: explore the experience of computer mediated clinical supervision; establish the extent to which online clinical supervision matches the expectations of supervisees and meet professional standards; describe differences between computer mediated clinical supervision and face-to-face clinical supervision; and evaluate how communication practices are adapted using different computer applications in the process of online clinical supervision. Method This presentation will illustrate: the development of the diverse research team; development of an ethical research proposal via collaboration through listserv communication; development of the project website (www.online-supervision.net); promotion of the research website; participants registering and indicating their suitability for inclusion or exclusion through website submission form (and quality control/training of participants); development of disclaimers and informed consent content; and technological design for matching supervisees within peer groups or and/or matching supervisees with supervisors. Results It is anticipated that from the 80+ mental health professionals who have registered an interest in participating as of January 2003, a significant number will go onto become research subjects, along with other recruits, to form small supervision groups and dyads. A five-phase design encompasses an initial phase of data collection to enable the team to match participants, followed by four follow-up phases at three-month intervals of web based questionnaire completion about their experience of online supervision for analysis. Results of phase one of the research project and subsequent matching of participants and their expectations about the online supervisory relationship are presented as the result of the methodological techniques demonstrated. This paper examines the ethical implications of nurses as tools, that is nurses carrying out the delegated or instrumental work of others. 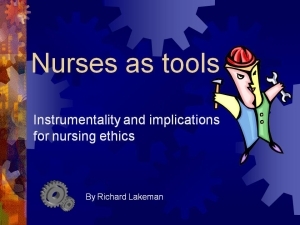 It is proposed that nursings' instrumental relationship with medicine, has in some instances led to an ethos, or moral climate which legitimises excluding nurses and patients from moral decision making and silences the moral voice of nursing. Nursings' involvement with compulsory psychiatric treatment is examined as a particularly problematic area of practice in terms of the legal requirement to carry out "doctor's orders" and exclusion from dialogue about the terms of treatment. Treating nurses as mere tools is challenged as unethical and the facilitation of a new health care ethos founded on values of collaboration, relationship and inclusion is proposed as a moral imperative for ethical health care. Most people who are in the business of trying to help people deal with difficulties in their lives, their relationships and with negotiating health, welfare and justice systems do so with the best of intentions. However, as the proverb goes 'the road to hell is paved with good intentions'. 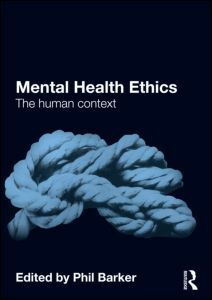 The importance of this edited book by Phil Barker is the unrelenting subtext that the best of intentions are insufficient to be ethical in the helping professions…. Lakeman, R. (2003). Ethical issues in psychiatric and mental health nursing. In P. Barker (Ed. 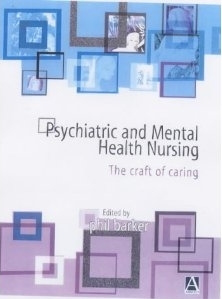 ), Psychiatric and Mental Health Nursing: The Craft of Caring. (pp. 504-514). London: Arnold. Lakeman, R. (1999). Commentary on 'Where care meets treatment: common ethical conflicts in psychiatric nursing'. In P. Barker (Ed. 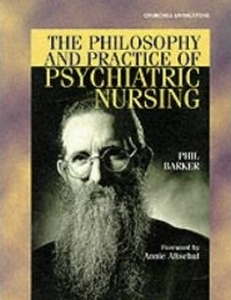 ), The philosophy and practice of psychiatric nursing (pp. 213-216). Edinburgh: Churchill Livingstone. Lakeman, R., & Curzon, B. (1997). Society, disturbance and mental illness. In P. Barker & B. Davidson (Eds. 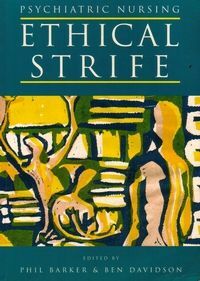 ), Ethical Strife (pp. 26-38). London: Arnold.